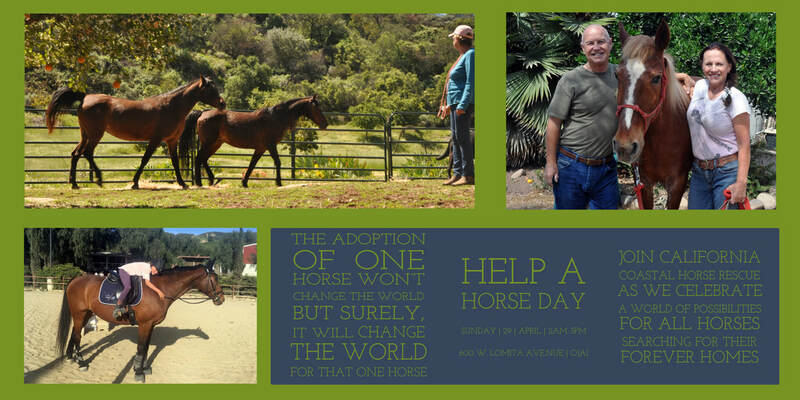 Spend the afternoon with the horses and volunteers of CCHR as we celebrate ASPCA “Help A Horse” Day! Learn how you can help lend a hand to help horses in need. Click here for more details! * Relax & enjoy a cool drink in the Triple “H” Beer Garden! California Coastal Horse Rescue celebrates its fourth annual Help a Horse Day in Ojai with a community/family fun day, bringing attention to the plight of horses in need. With a theme of “A World of Possibilities,” the open house is about raising awareness about abused and neglected horses and, equally importantly, to promote equine adoption. The event will feature activities for children, live music, food trucks, a beer and wine garden, vendors, games, raffles and, of course, the stars of the day — the CCHR horses. The event takes place from 11 a.m. to 3 p.m. at 600 W. Lomita Ave. in Ojai. For more information, visit www.calcoastalhorserescue.com.